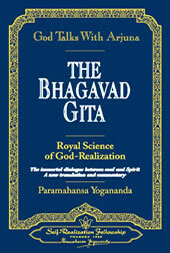 The entire knowledge of the cosmos is packed into the Gita. Supremely profound, yet couched in revelatory language of solacing beauty and simplicity, the Gita has been understood and applied on all levels of human endeavor and spiritual striving—sheltering a vast spectrum of human beings with their disparate natures and needs. Wherever one is on the way back to God, the Gita will shed its light on that segment of the journey. The Bhagavad Gita ('the song of the Spirit' ) contains teachings of Bhagavan Krishna in the form of a spiritual dialogue between Sri Krishna and his disciple Arjuna. He sees truly who perceive the Supreme Lord present equally in all creatures, the Imperishable amidst the perishing. "In this path (of yoga action) there is no loss of the unfinished effort for realization, nor is there creation of contrary effects. Even a tiny bit of this real religion protects one from great fear (the colossal sufferings inherent in the repeated cycles of birth and death)." from Me all creation emerges. With this realization the wise, awestricken, adore Me. O Descendant of Bharata (Arjuna), also know Me to be the Kshetrajna (Perceiver) [ Witness - the Universal Spirit & the individualized soul ] in all kshetras (the bodies evolved out of the cosmic creative principle and Nature). The understanding of kshetra [ the known ] and kshetrajna [ the knower ]—that is deemed by Me as constituting true wisdom. Arjuna, remaining immersed in yoga, perform all actions, forsaking attachment (to their fruits), being indifferent to success and failure. This mental evenness is termed yoga. Arjuna, the ideas of heat and cold, pleasure and pain, are produced by the contacts of the senses with their objects. Such ideas are limited by a beginning and an end. They are transitory, O Arjuna; bear them with patience! Brooding on sense objects causes attachment to them. Attachment breeds craving; craving breeds anger. delusion breeds loss of memory (of the Self). Loss of right memory causes decay of the discriminating faculty. From decay of discrimination, annihilation (of spiritual life) follows. —these constitute the threefold gate of hell leading to the destruction of the soul's welfare. These three, therefore, man should abandon. Verily, wisdom (born from yoga practice) is superior to (mechanical) yoga practice; meditation is more desirable than the possession of (theoretical) wisdom; the relinquishment of the fruits of actions is better than (the initial states of) meditation. Renunciation of the fruits of actions is followed immediately by peace. O Partha ("Son of Pritha," Arjuna), surrender not to unmanliness; it is unbecoming to thee. O Scorcher of Foes, forsake this small weakheartedness! Arise!